Home > Shop By Brand > Optimum Polymer Technologies > Optimum Poli-Seal 128 oz. New Formula! Optimum Poli-Seal 128 oz. New Formula! The ultimate one step product – it cleans, polishes, corrects, and protects! Optimum has developed a new and revolutionary “one step” product which will enable detailers to clean, polish, perform light correction, and seal the paint ALL IN ONE STEP! 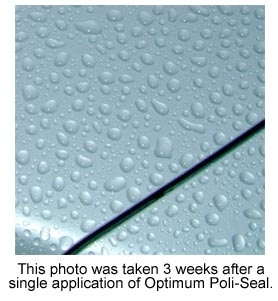 Optimum Poli-Seal is another excellent product from Optimum Polymer Technologies. Don’t mistake it for a cleaner wax. Poli-Seal cleans, polishes, corrects and seals paint under a smooth, glossy polymer shield. Poli-Seal does what other one-step products promise. In one easy application, you get the benefits of a fine swirl remover, a finishing polish and a high quality polymer wax. This product falls in just below the level of aggression of the Optimum Polish and can be used either after the Optimum Polish or even after a light compounding step with the Optimum Compound. For detailers who prefer a wax product that can be buffed on, or applied by hand, we now have what we think is one of the BEST sealers out there, and to be able to remove light scratches and swirl marks is truly an added bonus! Optimum Poli-SealTM is the most unique and versatile all-in-one product ever introduced! This easy to use, zero dusting, buttery smooth formula is so much more than a typical one step product. The micro abrasives in the Optimum Poli-SealTM will ensure light paint correction and not just the hiding of imperfections. Poli-Seal can be used as a light swirl mark remover, a final polish, and a true wax and sealant……All in one step! This revolutionary product will eliminate (not hide) minor paint imperfections and blemishes while creating a perfect shine on all types of paint. The bonus is the protection will last for months! It can be used by hand, or with any type of buffer. This is not a miracle product, but simply a detailer friendly, easy to use, paint correction and sealant all in one. You will be able to literally fly through your final step with the Optimum Poli-SealTM. We tested Optimum Poli-Seal on a silver 2003 Mazda 6. The paint is in good condition but has never been polished, though it is waxed every 3-4 months with a synthetic wax. The vehicle was washed and towel-dried before using Optimum Poli-Seal. The car looked clean and had no apparent dirt or oxidation. It had a few light but noticeable swirls on the hood and fenders. I used a white Spot Buffs 4 inch pad on the Pinnacle Polishin’ Pal to take advantage of the pad’s polishing ability. Poli-Seal has the texture of a hand lotion with no visible abrasives and it’s very easy to apply. Evidently the paint actually was very dirty (you should see my buffing towel!) and Poli-Seal started cleaning it literally on contact. I’ve used cleaner waxes and I’ve never seen a product work as quickly or as noticeably as Optimum Poli-Seal. This is much more than a cleaner wax. After Poli-Seal hazed over, I buffed the paint using a Cobra Microfiber Towel, flipping it often. Unbelievable. The towel was filthy with dirt and oxidation that was not even apparent before I applied Poli-Seal. The haze buffed easily and in no time, the car was completely polished and sealed. Optimum Poli-Seal cleaned the paint very well and therefore it looked crisper and clearer, but the nice surprise was how smooth the paint was. Poli-Seal eliminated the light swirls on the hood and fenders. The paint had a nice slickness and gloss, which is tough to achieve on silver paint. These results were achieved by hand application; machine application will enhance the polishing abilities of Poli-Seal. For machine application, spread a thin layer of Optimum Poli-Seal over the paint using a polishing pad on your Porter Cable 7424XP. Mist the pad with BLACKFIRE Pad Conditioner before using it, as Optimum recommends using a damp applicator. Buff using a Cobra microfiber bonnet over a lambswool pad. Keep an eye on the condition of the bonnet. When it becomes soiled, flip it inside out and continue buffing. Optimum Poli-Seal is currently available in a gallon. This is perfect for detailers. For enthusiasts, you’ll enjoy this product enough to justify having a gallon of it. In the final analysis, Optimum Poli-Seal is easy to use, cleans very well, and leaves a great, slick shine – even on light colored vehicles. Poli-Seal is an excellent one-step product for detailers or for anyone that likes quick, impressive results. Optimum Poli-Seal 8 oz. New Formula! Optimum Poli-Seal 32 oz. New Formula! 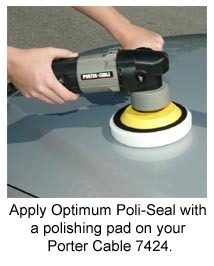 I purchased Optimum Poli-Seal after buying a new car and strongly desiring to protect it's nearly perfect paint. Many years ago I used a Dupont product called Rally Poly Sealant. That product was so good you could not get masking take to adhere to the paint when attempting to mask it for (in my case) respraying a '77 Seville's vinyl top dove gray. The tape simply rolled itself up. That product no longer being made (a real shame if there ever was one) I had to look for something I hoped would be close. I haven't tried applying take to the car but I think I've found a reasonable substitute in Optimum Poli-Seal. After thoroughly washing and drying my new Genesis, it was very easy to apply. Its quite smooth and buttery. Once dry it was also easy to remove with a soft clean rag made of T-Shirt like material. After a hard rain at work people noticed the nice water beads on my car in contrast with others next to it that had none whatsoever. Someone said to me,"Your paint looks well protected", and asked what I used. My only problem is that I have three cars and still have two more to take care of. This is a great product. I had just ordered Poli-Seal for the first time to try it out. We just finished a restoration on a 1998 travel trailer which hadn't been taken care of. After compounding, I used Poli-Seal and couldn't believe the results. Normally our restorations are a four step process, compound, polish, finishing polish and wax. After compounding and Poli-Seal, it looked amazing. Customer was blown away by the results. Great product!! Great product. Although I've used polymers that last a bit longer, if I were to rate overall performance by such things as ease of aplication and uniformity of apearance ( no streakiness ) I would rate optimum as #1. We detail high end motor homes ( up to $1 mil.) and our customers consistantly express how impressed they are with the end results. Five Star Product ! This product was quite easy to use. Got rid of a number of swirls as well as oxidation in just one application. Used PC 7424 - excellent results. I use Poli-Seal exclusively for all my AIO jobs. Easy on and easy off helps to speed through the process! Higlhly recommended.